At the end of 5th day, Visarjan - the immersion of the Idol will take place. It will be the most engaging part of this festival as all would be invited for the Visarjan Yatra full of colors and dancing to the tunes of Dhol. Shanti Business School Annual Alumni Meet brought to the esteemed alumni a chance to reconnect with their Alma Mater and let them relive the carefree days of their college lives as they get a chance to visit all the memories of their college. SBS had the First edition of the Annual Meet this year and had interactive events and entertainment activities with the motive of bringing student and alumni and the faculty together.In the two day voyage, alumni, faculty and students from all over the country participated in various networking sessions to help students in overcoming the uncertainties. Distinguished alumni from different sectors like Consultancy, Finance and Banking, FMCG, IT and Software etc were invited to address the gathering pertaining to their sectors. Alumni had a joyful time sharing their journey of following their dreams while few taking “Road Less Travelled”. There were Panel Discussions by senior faculty from various sectors on some of the desired topics and debated in the institute today. A variety of sports competition were arranged for the Alumni to indulge them in the sports spirit once again with their batch mates and juniors.In the end, SBS alumni shared their feedbacks on curriculum, teaching pedagogies and also shared their respective industry insights which could help in building a strong knowledge enriching environment.The first day ended ended on a musical night by Aalap Musical Group as the students gathered around their favorite stairs at SBS for a soothing Orchestra performance to lighten up their entire evening. Despite the presence of some clouds, the stars were out and shining at Shanti Business School this night.The Freshmen’s Fizzz, the Fresher’s Party of SBS, had come up with yet another unique theme: The Director’s Cut. And true to its title, the event was full of fashion and interesting celebrities. match the theme in order to demonstrate the oneness and cheerful camaraderie of SBS students. It was indeed a nostalgic night with DJ beats and delicious food augmented more curiosity and eagerness in the students for upcoming events at SBS Student Council committee said: “We have selected this theme as it allowed freshmen to showcase their favorite character from Hollywood. It gives full opportunity to every student to present themselves the way they want to be.”It was a visual delight, watching the freshmen students walk the ramp. The audience applauded the contestants for Mr. and Ms. Fresher for PGDM batch-2016-18. The participants were asked incisive questions by their seniors, which were the part of overall assessment. The SBS Plaza was decorated as a giant “Gazebo” with mellow lights and paper lanterns. It was no less than a fashion show. The evening started with the couples setting ablaze the ramp, heading towards a glam photo shoot. It was a delight to see the theme well appreciated with lavish tuxedos by boys and trendy beautiful gowns by girls. incoming batches from uninitiated freshmen to rightful members of a tradition that they will cherish and preserve. After that final selection round to select Mr. and Ms. Fresher for the year 2016 was organized which was judged by last year Title winners. Mr. Ankit Kothari and Ms.Prarthana Sachdev were being honored with the title. The freshmen of PGDM and PGDM-Communication 2016 had an interesting Photography competition. The rules were simple-no filters, no edits and the shot has to be inside the campus. Prof. Prashant Pareek, Asst. Professor in the area of Marketing and Communication has published a research paper in Journal of Studies in Management and Planning (published by edupedia publication), volume-2, issue- 6, June 2016. The paper talks about - Past Vs Present scenario of Television as a media. Television set has become a basic requirement almost for every household of our nation, there was a time when Indians had limited choice of programs and channels to view and entertain themselves, in that limited content the proportion of entertainment programs was very minuscule because for a long time period post independence government of India had a monopoly over the broadcasting of content through television as media vehicle. But today in the year 2015 Indians have so many choices and content to access, like we have around 300 television channels for news, information and entertainment, privatization has led to provide us with so many options for accessing information and entertainment on television media. Today’s generation Z who lives in urban India can hardly tell you the kind of content being broadcasted at Doordarshan. Our ways and means of accessing television has also kept on changing perpetually since the invention to television like earlier we used to have an antenna at our terrace for accessing television content and today most of the households even in rural areas have installed DTH. This study intends to explore through literature review that how digitization has impacted various sections of society specially the low income group (Bottom of Pyramid) households. How bottom of pyramid accesses the television content because a technology switch in television affects different income groups differently. This study also intends to unearth the concerns of most deprived section of population with regard to any barriers they face in accessing the content through television. Most of the information presented in this paper has been adapted from the Report of Media Foundation of India, New Delhi, 2015. Prof. Prashant Pareek, Asst. Professor in the area of Marketing and Communication and Mr. Debjyoti Sarkar, Alumni (PGDM-C) has published a research paper in Journal of Social Science, Knowledge consortium of Gujarat (KCG), Department of Higher education, Government of Gujarat (issue 21, May, 2016). The paper talks about - What is social media - Social media is a group of Internet-based applications that allows individuals to create, collaborate, and share content with one another. This study has tried to investigate how marketers have realized social media’s untapped potential by incorporating it as part of the larger social marketing strategy, and use it not only for promotion but also to improve corporate reputation & public relations. This study aims at looking how corporate and governments have used this tool for crisis management and to promote their brands. Social media, if used correctly, may help organizations increase their capacity for putting the consumer at the centre of the marketing process by providing real time solutions .The purpose of this study is also to investigate the different uses of social media, its limitations, and the differences from traditional media. The study also comprised of investigating the exposure of social media amongst youth and the time spend on it for what purposes. This study has been conducted at Shanti Business School, Ahmedabad on 200 students pursuing their graduation as well as post graduation courses. Prof. Raviraj Gohel has co-authored a research paper which has been published by Institutional Investor Journals,2016 and also by IUP journal of applied finance, 2015. The in-depth research on the above topic, has given lots of insights, which includes investigates factors driving abnormal returns in private equity funds in India from 2007 to 2012. In the research they have found that skill factors such as type of exit route, holding period, size of investment, stage of investment, and type of industry significantly affect abnormal returns of private equity funds.In addition, market factors such as investment year, entry and exit value of S&P CNX Nifty, and market return during the period of the deal as well as a fund’s structure also drive abnormal returns in private equity funds. Type of exit route jointly influence abnormal returns in private equity funds. The lawns of Shanti Business School bustled with enthusiasm as the Institute staged its 5th convocation for the PGDM & PGDM-Communication & PGDM-Executive students. A batch of total 142 students, were awarded their Diplomas by the Chief Guest, Dr. BP Sanjay. Dr. Sanjay, a PhD from Simon Fraser University of Canada, was the founding Vice-Chancellor of Central University of Tamil Nadu and is a communication scholar of international repute. In his illustrious career he was Director of the prestigious Indian Institute of Mass Communication, New Delhi, and Pro-Vice Chancellor of the Central University of Hyderabad. He is currently the Director, College of Integrated Studies at Central University, Hyderabad, and specially came to Ahmedabad to grace the occasion. Before the start of the Convocation proceedings, he planted a sapling to commemorate the event. In his address to the students he congratulated all the Convocating students and wished them best for their future. Dr. Arbind Sinha, Director General, SBS, earlier introduced the Chief Guest and also gave insights on the academic year. Shri. Jyotiprasadji Chiripal, who Chaired the Convocation complemented the students for their commendable achievement & advised them to have a clear vision and purpose for their goals. Tata Capital, Helios, Godrej, VIP Industries, amongst others. Divya Dubey who was awarded student of the year for her overall academic and extra co- curricular activities said “It’s one in a lifetime experience! I have really worked hard for 2 years and it feels so good when your institute values your hard-work. I am speaking on behalf of everyone here, this day and moment, when you convocate and step into a career, will forever be in our memories. We are sad leaving SBS but look forward to continuing our relationship as alumni”. After the convocation a celebratory dinner was held for all students. Prof. Prashant Pareek, Asst. Professor in the area of Marketing and Communication at Shanti Business School, Ahmedabad, has written a book titled “Cluster Development: A Research Journey of Taking Foundry to Dairy.” It has been published & released by Lambert Academic Publishing (LAP), Germany on 11th March 2016. In this book Prof. Pareek has narrated his Project and Field Research journey when he worked for Micro, Small and Medium Enterprise (MSME) Foundation, New Delhi. The Project was supported by Department of Science and Technology (Government of India). During this live Project, the author had prepared a frame work for an industrial cluster based in Haryana State to explore business opportunities in Gujarat State. This book has presented the theory of cluster development in a very practical manner as it documents steps through which the author himself passed through when he worked on the said project. 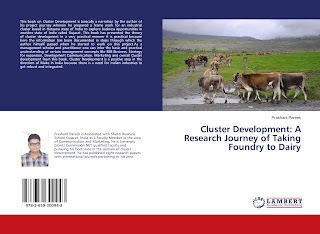 Cluster Development: A Research Journey of Taking Foundry to Dairy. A management scholar and practitioner can also infer the basic and practical understanding of certain management concepts like B2B Business, Strategy for expansion, Development Communication, Marketing and Cluster development from this book. Prof. Pareek added “When our current policy initiatives are focusing on ‘Make in India’, and recently announced budget puts agriculture sector as area of concern for government, this book highlights how an effective integration of Industry, Co-operative sector and Government can lead to maximum awareness and benefits for the Farmers of our Country.”Book will be available for purchase on Amazon.com after 25th March 2016. 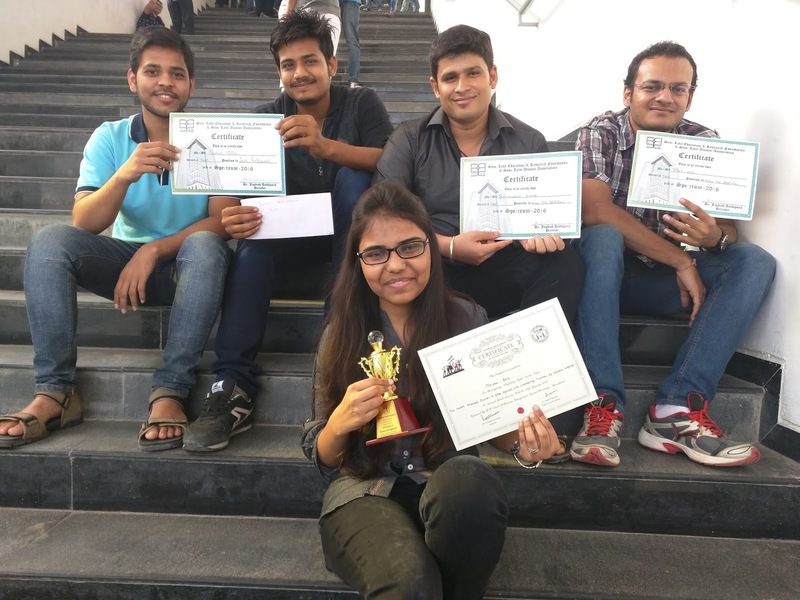 Shanti Business School students added glory to their college by winning a national level competition hosted by B.K School of Business Management & an inter college competition hosted by SomLalit Institute of Management. B.K School of Business Management celebrated its 40 years of establishment by hosting and organizing an event – “National Youth Summit 2016”. It was a national level competition where, 200+ students participated and submitted their research papers on “Empowering Youth, Empowering India”. SBS’s winning streak continues in an inter college event- “Spectrum” which was hosted by SomLalit Institute of Management. Padeep Mishra & Vishal Mishra of PGDM batch 2015-17 stood first in Youth Parliament” which was a debate competition which continued till three levels. Vishal quoted “With every round each participant was getting eliminated but we were sure that with our confidence and conviction we can crack every level”. Similarly Gandharva Kumar and Vivek Vora of PGDM batch 2015-17 also stood first in “Brainaica” – A quiz and mind games activity. Vivek quoted “There were 40+ participants and winning this competition has given us more confidence, encouragement and energy to participate in more such competitions”. The week started and ended on a winning note for Shanti Business School’s students and hope it further continues. Hosted by PDPU, Shanti Business School’s student wins an Inter College Film making competition. Based on the theme "Technodiction (Technology + Addiction)" – Impact of technology on our social lives”, a team of 8 students showcased their thoughts in a 4min short film. One of the team member Yagnesh Goswami said “In today’s world technology is important and is everywhere but its usage depends upon us, if we can set our priorities right and use it as and when we require then I think it’s an advantage otherwise it’s going to be the other way around, instead of we driving the technology, it will drive us. And especially among the youngster we have seen this thing happening. Addiction of anything is harmful and in today’s digital world it’s very crucial to adapt ourselves in a way that we can strike a perfect balance between our social family lives & technology, and this is what we have depicted in our film.”This was an inter college competition and was open for colleges across Gujarat. The winner of this competition was based on youtube likes and comments (based on the popularity) – more so over audience were the judge of this competition which made the victory for these students even more sweet and special. Apart from the certificates students also received a cash reward from the organizers. Dr. Vipul Patel, Associate Professor in the area of Marketing & research at Shanti Business School, Ahmedabad, conducted a research on “Young Consumers’ Intention to Use Mobile Wallet Services”. With the launch of the ‘Digital India’ Programme, it was important to understand the growing and popular trends which are spreading across the length and breadth of the country and in different age groups.Mobile wallet service is the latest phenomenon produced by mobile technology in India. Mobile wallet is a mobile-based virtual wallet that works through apps. The consumer is required to open an account with any mobile service provider and credit desired amount of money in their account. The consumer can then make payments as easy as a few taps on his mobile to pay vendors listed with the mobile wallet service provider. appreciating he or she should use the mobile wallet services), facilitating condition (the degree to which an individual believes that a technical infrastructure exists to support the use of the mobile wallet services). This study found that consumers perceived that the mobile wallet services are useful and increased their efficiency as a buyer. Smart phones are very popular among youngsters now, and they feel very easy to learn and use mobile wallet services. This study also found that ‘facilitating condition’ has significant and positive effect on intention to use mobile wallet services. Mobile wallet service providers must therefore create technical infrastructure that supports the usage of mobile wallet services. It was also found that ‘social influence’ did not have any impact on intention to use of mobile wallet services among youngsters. This implies that youngsters perceive that usage of mobile wallet service do not enhance their social status and prestige. Therefore, mobile wallet service providers must associate the adoption decisions with gaining social status to promote the adoption of mobile wallet services. The skies over Shanti Business School were flecked with multicolored kites when the college hosted its first ever Kite Flying Festival. The theme of the entire event was “Uniting India”, which included a poster making competition amongst the students. The SBS Student Activity Committee members came up with the idea this year as a way to "get the students coming from different communities and from different states involved in the festival and a bonhomie of all cultures" said event coordinator – Akash Vazirani . "An allied objective was to get people out here to not only enjoy flying kites, but also learn about safety measures which are important while flying them,”. The committee members also shared the helpline numbers of bird rescuers who are experts on how to rescue injured birds, avian handling and transportation, veterinary triage, first aid rehabilitation and release. The celebrations began with a Poster Competition on UNITING INDIA where students exhibited their creativity. ‘Religion doesn’t divides but unites’, ‘Be compassionate’, ‘Save yourself by not discriminating’, ‘Be united & be victorious’ were few messages that were conveyed through these posters. The winner of this competition Abhishek Vacchani said “This activity is a great initiative; it gives us freedom to express ourselves not in words but through our imagination and creativity. The kind of concepts, colors, and messages are expressed by each and every one of us, shows our internal spirit towards this thought”. The Second Prize was won by Muskan Bhansali, Nilakshi Vyas and Mahima Daga and the Third by Harsh Lachwani and Divya Patel. Students of all the programmes at the institute participated and received appreciation from the Director General, Dr. Arbind Sinha, Program Directors and Faculty members. In the afternoon, tudents were seen on the ground enjoying the kite flying along with faculty and staff members. There was continuous houling of “Kaipo che”, “Lapet” which reflected passion and enthusiasm of the spectators as well as the students.